(Nanowerk Spotlight) Printed electronics – the application of printing technologies for the fabrication of electronic circuits and devices, increasingly on flexible plastic or paper substrates – have been around for a while. Printed electronics has its origins in conductive patterns printed as part of conventional electronics, forming flexible keyboards, antennas and so on. Then came fully printed testers on batteries, electronic skin patches and other devices made entirely by printing, including batteries and displays (read more: "Printed electronics widens its scope"). Despite its increasing use, printed electronics applications are still challenged in terms of performance, processing costs, and especially complementary metal–oxide–semiconductor (CMOS) industry incompatibility. "For that reason, we wanted to create a new method to print high-performance electronics by combining the extremely mature CMOS fabrication processes and recently developed additive manufacturing techniques," Muhammad Mustafa Hussain, an Associate Professor of Electrical Engineering at King Abdullah University of Science and Technology (KAUST), tells Nanowerk. "This challenge motivated us to come up with a solution where circuits are not printed starting from sublevel devices (transistors) but instead prints complex CMOS circuits fabricated using the most advanced nanofabrication techniques." Hussain and his team have reported their new findings in the October 13, 2016 online edition of Advanced Materials ("Decal Electronics: Printable Packaged With 3D Printing High-Performance Flexible CMOS Electronic Systems"). "For the first time, an affordable and reliable manufacturing process for the integration and packaging of fully flexible high-performance electronics has been developed for future Internet-of-Everything (IoE) applications," says Galo Torres Sevilla, a former PhD student in Hussain's group and the paper's first author. Such decal electronic systems could be used like RFID tags are today but with much more functionality and performance. The researchers' comprehensive integration strategy made use of mature CMOS-based technology – photolithography, deposition, and patterning on a low-cost silicon (100) substrate – to flex thin-film based electronics on silicon, and then to package them using 3D printing and finally print such packaged decal electronics on soft substrates enabling high volume manufacturing. The roll-to-roll printing capability gives decal electronics the advantage of allowing high throughput in highly complex flexible electronics systems. 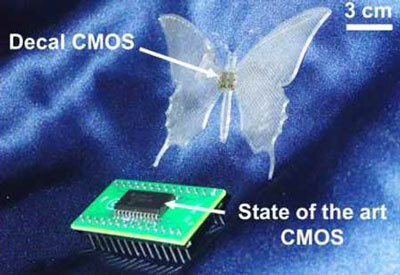 Importantly, the demonstrated circuits show no performance degradation due to flexing or packaging processes. The packaging materials are printed using 3D printing technologies and the interconnections are made using inkjet printing of silver nanoparticles-based inks. Finally, the system scale printing is done using a custom made roll-to-roll printing platform. The main advantage of this work is based on the development of a universal platform for printed electronics. Here, the researchers show that inorganic-based electronics cannot only be encapsulated in rigid and large footprint packages, but also be packaged in flexible and low cost decal-like structures that are able to maintain the outstanding electrical characteristics of state-of-the-art electronics, breaking the long-lasting status quo of rigid high-performance electronics. Furthermore, the reduced cost, material usage, and time of 3D printing technologies can be taken advantage of to create a common platform for future flexible high-performance electronics. Also, a key advantage of decal electronics is that it opens up multiple opportunities for the realization of IoT and IoE applications by providing a mean to integrate any kind of electronics, from CMOS circuits to sensors, in virtually unlimited surfaces due to the conformality provided by the flexible form factor of decal electronics. "The most significant achievement is the development of a new integration strategy to package, interconnect, and print inorganic-based high performance electronics with uncompromised stability and electrical characteristics," Galo points out. "This opens up multiple opportunities for applications such as, printed communication devices and flexible high-performance electronics, where current printed electronics are just not able to satisfy the performance requirements." While this process is still in early development, its full potential is very promising. Applications in the area of home automation, didactic electronics, and high volume fully flexible consumer electronics are just a few examples of what could be achieved with high-performance printed electronics. Also, the simplicity and reliability of the process makes it suitable for future IoT applications, where performance is not the only required feature but also form factor plays a significant role. The next stage of this research will mainly consist of transforming highly complex circuits into decal electronics. This will result in the capability to integrate fully flexible systems into a single platform at reduced costs and times. "We believe that the future of electronic applications is profoundly based on the introduction of new form factors to electronic devices," Hussain concludes. "In this present work, we show that inorganic high-performance devices can finally be used for IoT and IoE purposes without the need of highly complex and expensive processes." "In terms of technical challenges, the key factor will be to include a flexible power source together with the high-performance electronics," he says. "However, we are currently working on the development of a flexible solid-state battery that will be able to complement the concept of decal electronics." Today in a traditional electronic lab setup, all integrated circuits (ICs) look the same. The researchers show that every IC can have a face, a shape, a size - an identity. Instead of placing them on breadboard or PCB, one can place them on any substrate and then draw wire connections as one wants and can see a whole system is built.